It was the morning of our flight back to Seattle, after 2 weeks in California. Since it was an afternoon flight, we had one more meal to eat in LA. Based on all the crappy overpriced food we had been consuming over the past week, it was time to cleanse ourselves. We needed to dine on something interesting and didn't have the words "critters, pals or $8.95 hot dog combo" on the menu. Meeting up with my cousin (who drove all the way out from Chino Hills, what a great cousin! 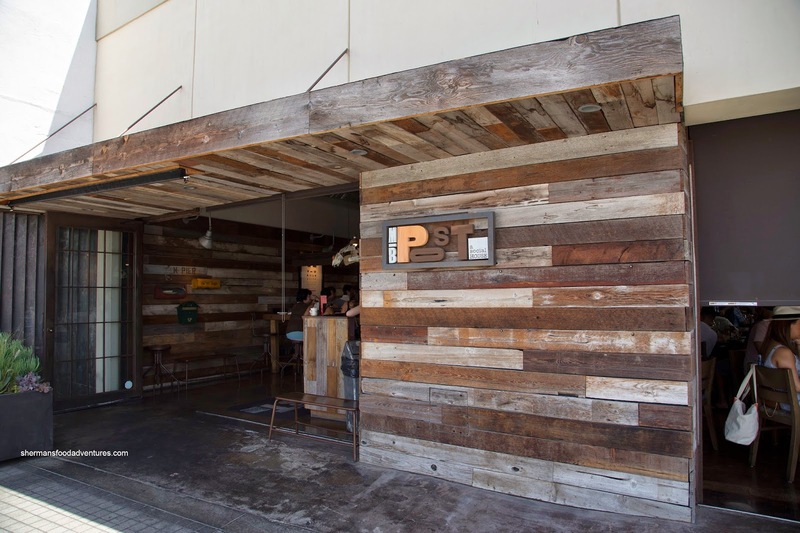 ), it was determined that we would go for brunch at MB Post (as its name suggests, located in Manhattan Beach). We decided to share everything which was music to my ears. 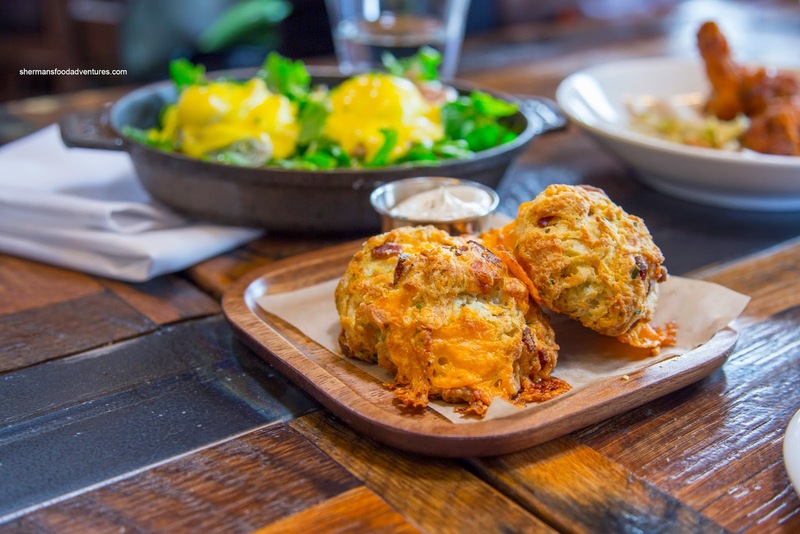 Our meal began with authority as the Bacon Cheddar Buttermilk Biscuits were placed in front of our salivating and wide-open mouths. These were firmly crispy on the outside while buttery, cheesy and savory on the inside. 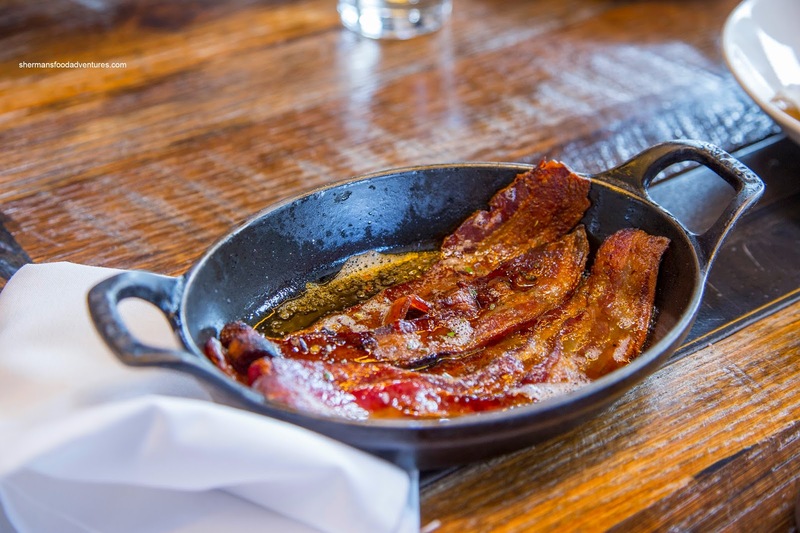 The bits of bacon were crisp with rendered fat while the herbs really came through. 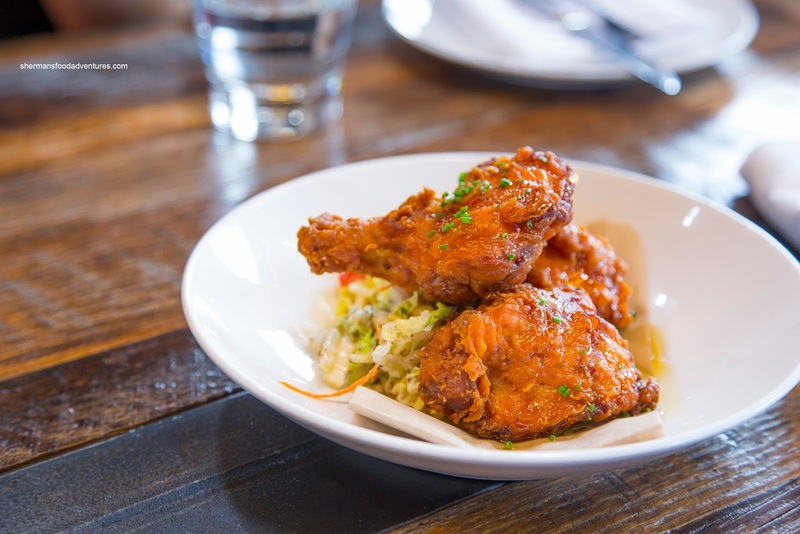 The good eats continued with the Truffle Honey Laced Fried Chicken with kohlrabi slaw. The pieces of chicken were crunchy where the batter stayed adhered to the meat. Inside, the meat was moist and flavorfully brined. The whole thing was tossed in a glaze that was sweet with a slight spice. We found the truffle to be present without being overwhelming. 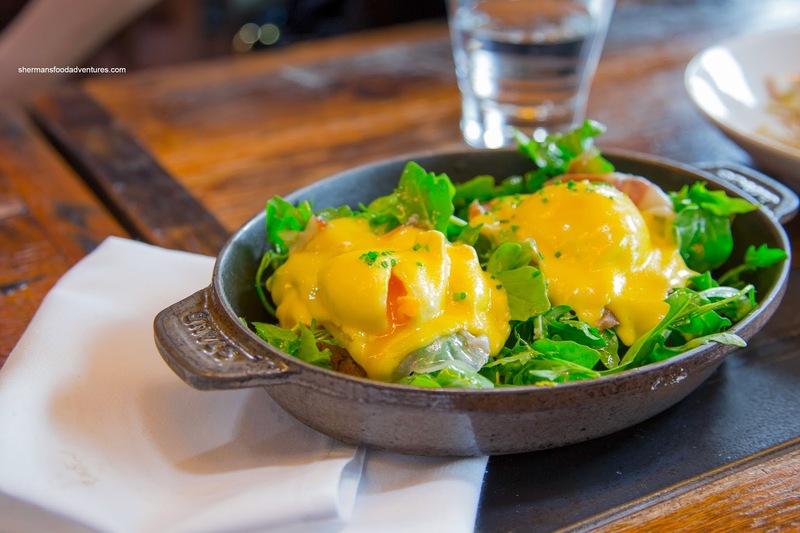 Next, we had the Benedict with a bacon cheddar biscuit, arugula, La Quercia Tamworth Prosciutto and Hollandaise. As evidenced in the picture, the poached free-range eggs were beautifully runny. Of course the whole thing started off on the right foot with the wonderful cheddar biscuit. Although the prosciutto was salty, the rest of the ingredients, including the substantial biscuit, peppery arugula and poached egg helped even out the flavors. As for the Hollandaise, it was creamy, silky and well-balanced. 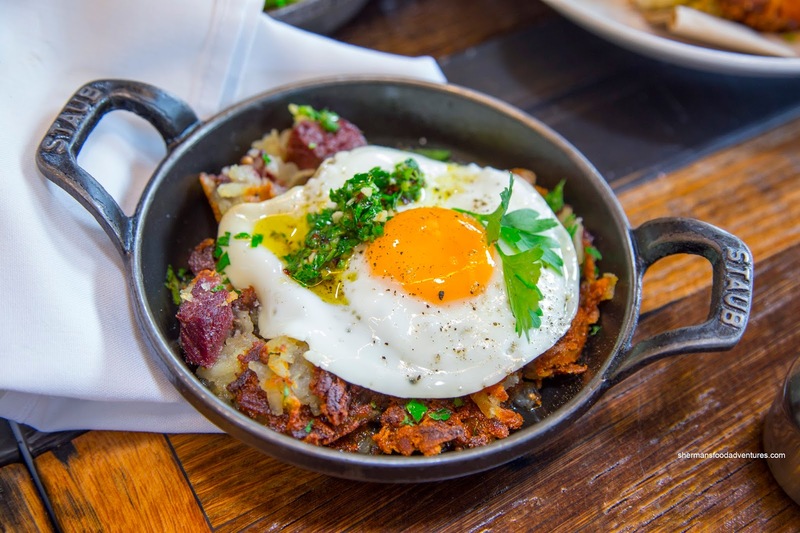 Continuing with another dish that featured a nicely sunny side up egg, we tried the Corned Beef Cheek Hash which was accented by sherry vinegar and gremolata. The flavorful corned beef was crisped up while the potatoes were soft on the inside and crunchy on the outside. The dish was only oilier side, but the vinegar and gremolata added a certain brightness and acidity. 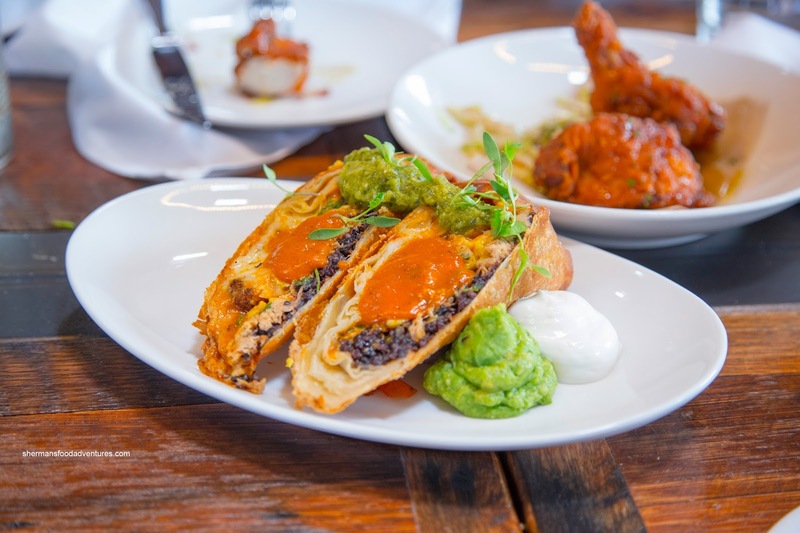 Just because it sounded interesting, we took a chance on the Chimichanga with scrambled egg, chipotle chicken, pepperjack, black rice, plantains and salsa verde. Surprisingly, this was one of our favorites as the exterior was appealingly crunchy while the filling featured moist chicken and a wealth of flavors including zesty, spicy, cheesy, sweet and salty. We thought the guacamole on the side was well-executed as it was creamy and bright. 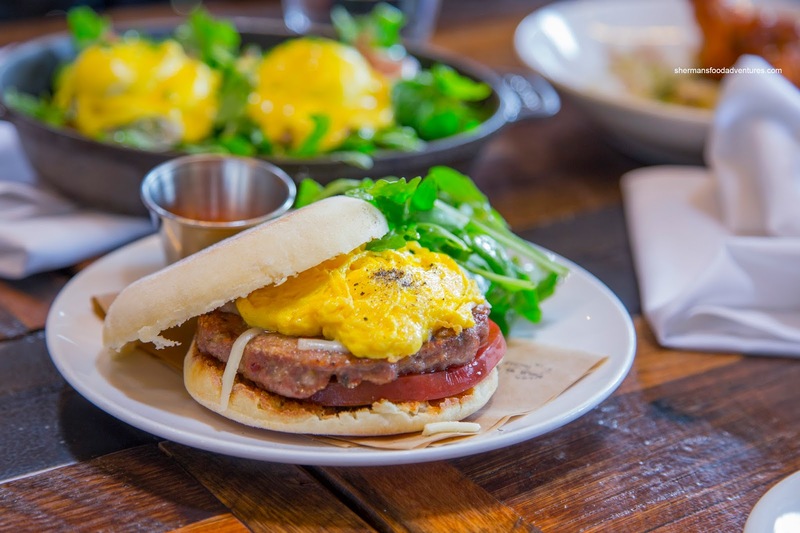 For the kiddies, they shared the Breakfast Sausage Sandwich consisting of Calbrian pepper (served on the side in this case), Fontina, tomato and scrambled eggs. Not a whole lot to say other than the fact that the sausage was meaty and peppery while the egg was airy and not overdone. You move to LA? Noticed that many of your posts over the past couple of months are from out of town. @fozzy882001 Nope, still here in Vancity!